HITS » The FEI CSI5* Division Continues with the $35,000 HITS Jumper Classic! The FEI CSI5* Division Continues with the $35,000 HITS Jumper Classic! Thursday afternoon, HITS-on-the-Hudson hosted the second of four FEI classes at the HITS Championship, the $35,000 HITS Jumper Classic. When all was said and done, Margie Engle would capture the blue ribbon by three-tenths of a second with the 9-year-old gelding, DICAS making it his fifth FEI class win since July. Of the 33 horses that challenged the track set for the first round, set by Marina Azevedo of Brazil, none but five would return for the Jump-Off. "I thought the course today was tough enough," said Engle. "It was a big track and a couple of the lines rode very difficult, like the in-and-out to the triple bar to the vertical, which walked a little bit long so a lot of horses had trouble with that. The skinny is always a careful jump and you had a long canter down to it and the inside turn was a little tight so that caught a couple of people." 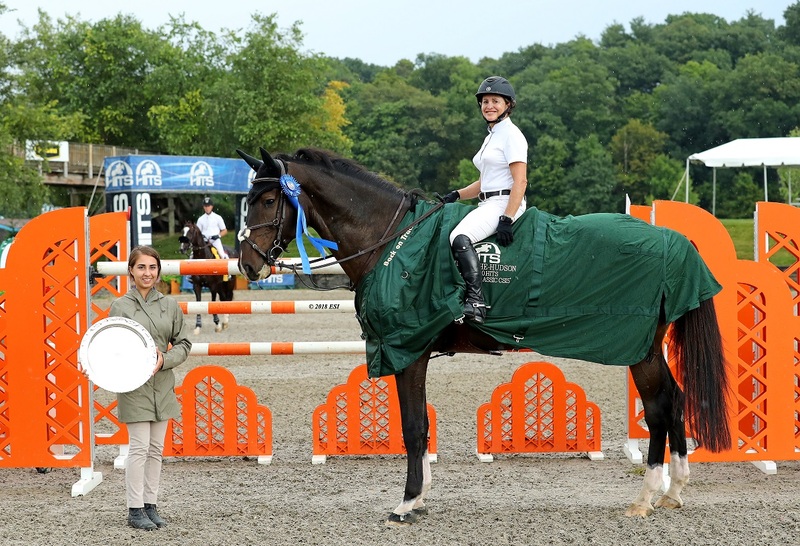 The course posed its challenges in the Jump-Off for the first two riders as well, including Heather Caristo-Williams, resident of Saugerties, who showed the way aboard QUI VIVE DES SONGES Z. The first fence, the KindredBio vertical, proved to be a challenge, and a rail at the second fence resulted in an eight-fault score. Finishing with a time of 44.97, Caristo would land in fifth place. Second to return for the Jump-Off was Jonathan Corrigan aboard LOUGHNAVATTA INDIGO. Corrigan approached the course with a clear plan to win and finished with the fastest time in the jump-off of 36.28, but opposite of Caristo, Corrigan ran into trouble late in the course. With rails at the final two fences, Corrigan and his mount would finish with eight faults for fourth place. Margie Engle, who has represented the US Team at the Olympics, World Equestrian Games, Pan-American Games, and more, would follow behind Corrigan aboard DICAS. 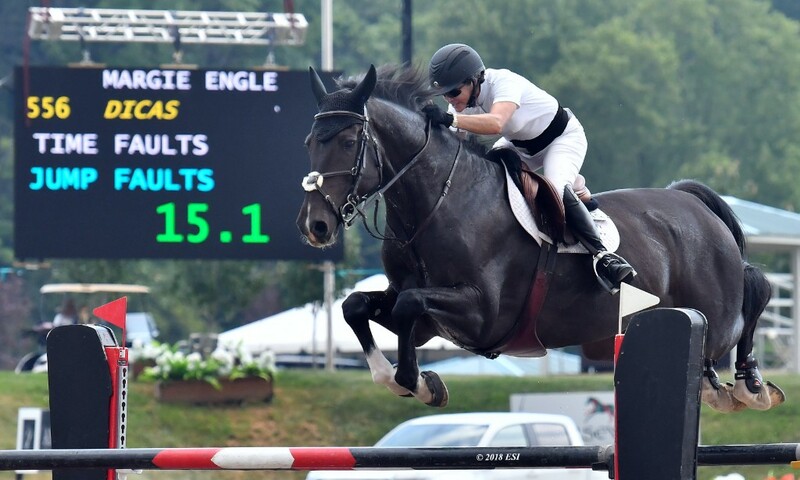 Engle and DICAS had no issues covering ground as they glided through the Jump-Off crossing the timers in 37.01 and setting the Great American Time to Beat with just two riders to follow. Engle was pleased with DICA's performance, and says he is a joy to have in the barn "He's easy to ride and very straightforward. He has a great temperament, he's not hot nor lazy." The next to challenge the course with hopes of catching Engle’s double clear ride was Tracy Fenney aboard IGOR VAN DE HEIBOS. While her mount appears to not have as big of a stride, Fenney made smart decisions and was really giving it her all to catch the lead. Almost spot on, Fenney would finish in second place by three-tenths of a second crossing the timers in 37.33. The last to return for the shortened course was Jonathan McCrea aboard ARISTOTELES V. McCrea was tidy around his turns and accurate to the fences, but just not quite fast enough to take the lead as he crossed the timers in 41.18 for third place. Watch these riders and more compete in the $100,000 Hudson Valley Jumper Classic today at 2pm! Not at the show? Catch it LIVE on Showhorse TV! The high performance competition continues today with the $100,000 Hudson Valley Jumper Classic! Follow along with the Order of Go.